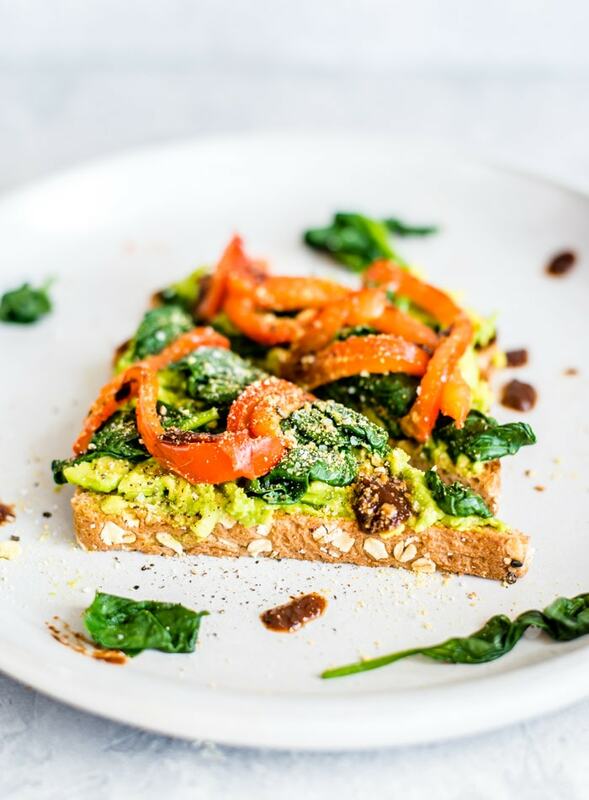 This vegan roasted red pepper spinach avocado toast is topped with homemade roasted red peppers, sautéed spinach and vegan parmesan. It works great on any toasted bread, rice cakes or crackers and makes a healthy breakfast or light lunch. 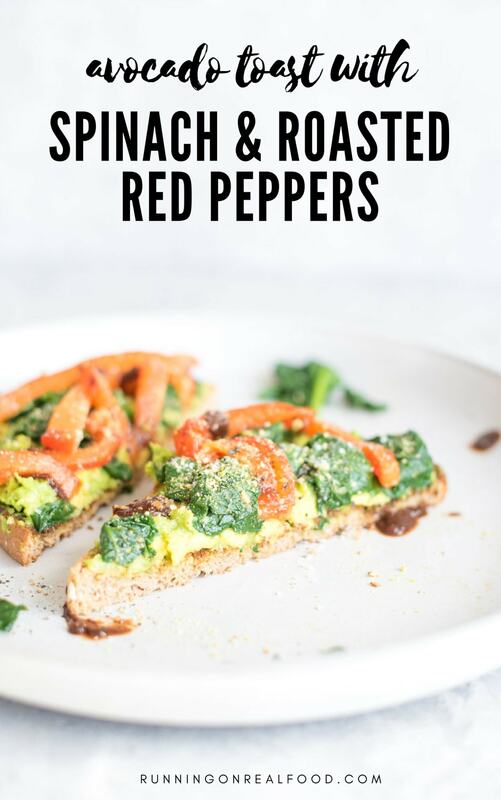 I’ve shared quite a few roasted red pepper recipes on the blog before. There’s my Roasted Red Pepper Tomato Soup, Roasted Garlic and Red Pepper Zoodles, Mediterranean Farro Salad Bowls and Roasted Red Pepper Pesto Pasta with Kale. They’re so easy to make and add delicious flavour and texture to all kinds of dishes. Try them in sandwiches and wraps, in pasta, homemade sushi, salads and of course, on avocado toast. Slice red peppers in half, remove the seeds, then smash down flat on a baking tray with the skin facing up. Place in the oven and broil until starting to blacken and bubble. You can let them get quite black as you’ll be peeling the skin off afterwards. Once the skin is blackened, remove from the oven and either wrap them in foil or cover with a dish cloth. Let them steam for 15 minutes. This is not totally necessary but I find they’re easier to peel if you do this. Once they’re cool enough to hand, peel the skins off and use however you like. To make it , simply add the ingredients to a blender or food processor and pulse a few times until the texture resembles parmesan cheese. You can store any extra in the fridge for up to 3 weeks and use on all sorts of recipes like homemade pizza, pasta, salads, soups and more buddha bowls. The salt and garlic powder are optional but they do add a bit of extra flavour. You can use any kind of nut or even sunflower seeds to make it but I usually always use raw cashews. Almonds or pine nuts are good too. You’ll need nutritional yeast to add the cheesy flavour you’d expect from parmesan and the cashews give it just the right texture and perfect hint of sweetness. You can store the finished product in the fridge for up to 3 weeks. I like these Weck jars for storing it. 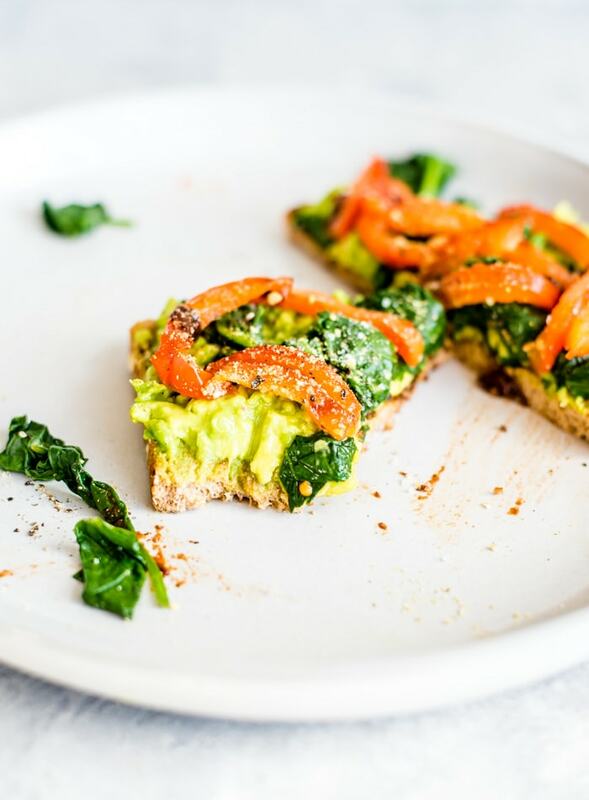 This yummy spinach avocado toast is perfect for a savoury, nutrient-rich vegan breakfast that can be prepped ahead of time for healthy meals, lunches and snacks all week. 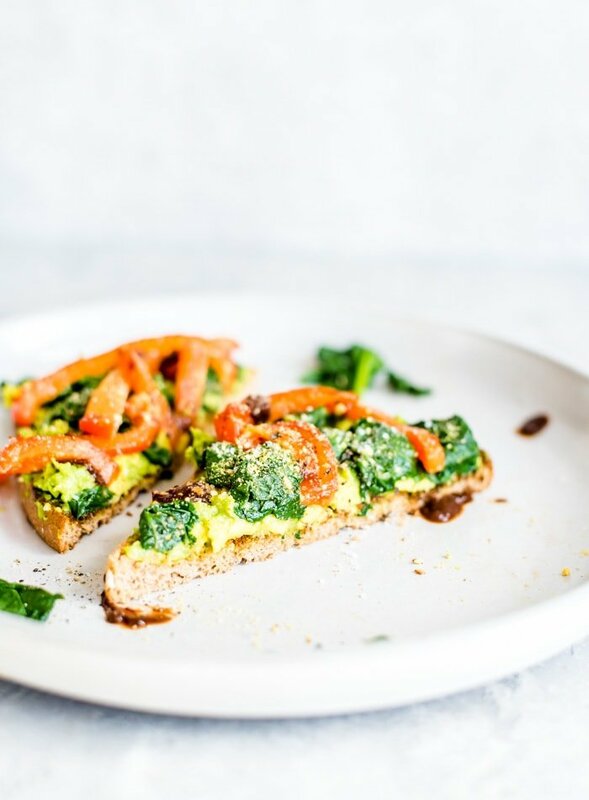 You can make the roasted red peppers, vegan parmesan and sautéed spinach in advance so all you need to do is toast some bread and smash some avocado. This recipe works well on toasted bread but is equally as good on rice cakes, corn cakes or Ryvita crackers. For more avocado toast ideas, check out my Hummus Avocado Toast and Smashed White Bean Avocado Toast. 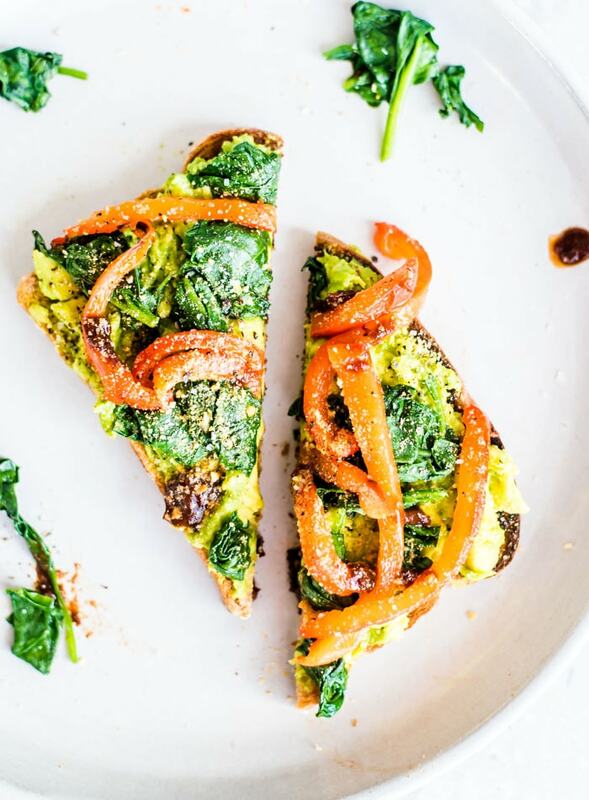 This twist on avocado toast features soft spinach, homemade roasted red peppers, vegan parmesan and optional hot sauce. Try it for a healthy vegan breakfast or light lunch. Cook the spinach by adding it to a pan with a splash of water and cooking until dark and wilted. Prepare your toast or crackers. 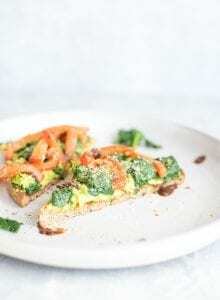 Mash the avocado in a bowl then spread over your toast. Top with the sea salt and pepper, spinach, sliced roasted red peppers, a sprinkle of vegan parmesan and optional sriracha. I love it. I make my avocado toast very similarly (sometimes I’ll add canned mushroom oddly enough to go with the peppers). The rice cake suggestion is also great. I love rice cakes but haven’t had one in ages. Going to try that for sure.